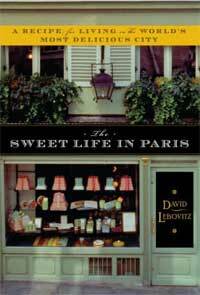 Like so many others, David Lebovitz dreamed about living in Paris ever since he first visited the city in the 1980s. Finally, after a nearly two-decade career as a pastry chef and cookbook author, he moved to Paris to start a new life. Having crammed all his worldly belongings into three suitcases, he arrived, hopes high, at his new apartment in the lively Bastille neighborhood. But he soon discovered it’s a different world en France. From learning the ironclad rules of social conduct to the mysteries of men’s footwear, from shopkeepers who work so hard not to sell you anything to the etiquette of working the right way around the cheese plate, here is David’s story of how he came to fall in love with-and even understand-this glorious, yet sometimes maddening, city. The more than fifty original recipes, for dishes both savory and sweet, such as Pork Loin with Brown Sugar-Bourbon Glaze, Braised Turkey in Beaujolais Nouveau with Prunes, Bacon and Bleu Cheese Cake, Chocolate-Coconut Marshmallows, Chocolate Spice Bread, Lemon-Glazed Madeleines, and Mocha-Crème Fraîche Cake, will have readers running to the kitchen once they stop laughing. The Sweet Life in Paris is a deliciously funny, offbeat, and irreverent look at the city of lights, cheese, chocolate, and other confections.